Hi friends! It’s Kelly here from EMHS Foundation Children’s Miracle Network Hospitals. Please join us in saying good luck — we refuse to say good bye — to our friend, Chad Daggett, manager of the Sam’s Club in Bangor. 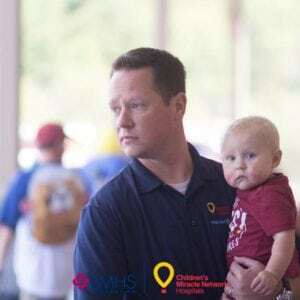 Chad, who has been manager of the Bangor Sam’s Club for the last few years, truly lives by Walmart and Sam’s Club’s motto, “Help Kids Live Better.” Himself a father of four, Chad has gone above and beyond to make miracles happen for Maine kids during the Club’s annual Miracle Balloon campaign. And two years ago, Children’s Miracle Network Hospitals recognized his inspiring efforts by naming him Local Business Person of the Year. We couldn’t be more thankful for Chad and his team. We’re sad to see him and his family, who are always right by his side at fundraising events, so we’ll say congratulations on your promotion, and best of luck to the Daggett family as they move to Ohio.